The types of content that people regularly share & how they share it. Reception to that content & the types of engagement received from others. The many different levels of authority those engaging profiles have & times it varies. The number of actual engaging followers & especially authority influencers. Amount of posts shared by the engaging profiles & the particular times shared. The biggest concept I will disprove in this article is that, All posts from a specific Google+ profile are generally equal in ranking authority & stay that way for any length of time. In fact I've done some detailed analysis on this & will show you there is a wide range of authority levels that individual posts receive, with engagement typically being the biggest varying factor. 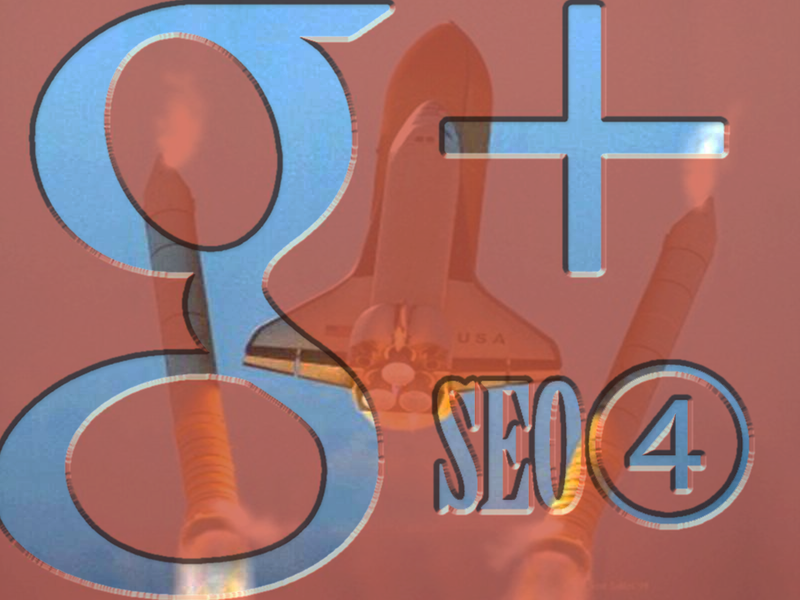 I will also show you how that ranking power rises & falls based on the ever changing conditions of the Google+ stream. All posts from any one specific Google+ profile are generally equal in ranking authority & will stay that way for a predictable length of time. Several common behaviors are often noticed with the way Google+ posts rank in Google Search that are quite unlike the search ranking patterns we have been familiar with from traditional webpages. Understanding the patterns that this content usually follows in search & why, can explain a lot of the confusing anomalies that have been seen when trying to test the results of a Google+ campaign, or the search ranking affects of specific Google+ content. Complicating this matter considerably, is that these search ranking behaviors can vary widely depending on the authority of the particular profile or page sharing the content, the reception of that content from relevant followers, the authority of those followers, the timing of the posted content & the ongoing posting habits of not only the original posting profile, but also all of the profiles who reshare that content. An original Google+ post is publicly published. Within hours, or sometimes days, the post is crawled & indexed by Google Search. The initial search ranking position for the post is typically just moderate. Other Google Plussers start engaging with and sharing the post. Within hours or days, the post gains authority & starts rising to first page ranking positions. Higher authority G+ Profile shares may quickly or immediately outrank the original post. The higher authority shares may get indexed first & in that case usually outrank the original. The ranking of this G+ content will continue to rise erratically over the following days. After days or weeks the G+ content noticeably drops, then settles to a more stable rank position. The original post sometimes ends up retaining enough authority to outrank earlier authority shares. This social media search ranking roller coaster can be terribly perplexing & even frustrating to many, because they may get terribly excited by the initial high content rank, then equally disheartened by its settling. This quick rise & then gradual falling pattern has sometimes been attributed to Google's Query Deserves Freshness (QDF) algorithm, first described June 2007, by Amit Singhal in New York Times, Google Keeps Tweaking its Search Engine. Certainly this is an important factor for plenty of notable fresh topics, especially newsworthy stories. Matt Cutts also discusses these phenomena in Why does a page's ranking change over time. The QDF algorithm works great for and explains many notable new topics, but this doesn't explain the ranking patterns we see throughout most social media content, namely content that is not particularly notable, is not a timely topic, and is sometimes just reshares of previous stories, but not necessarily new. Unlike the design structure of traditional websites, Google+ posts are all linked from, but travel in only one direction from the strong authority homepage & that is AWAY. What I mean by the homepage is the Google+ content that first loads from a profile without you scrolling down the stream to other pages, which are then loaded as you reach them. If you view the source code to an uncached profile page prior to scrolling, you will see there are a limited number of posts there. The authority that Google+ posts receive is PageRank, and PageRank was originally designed as a probability algorithm, a calculation of the odds that a random surfer will find your page. So in general, the intention is that the further away a page gets from its primary linked source/s (ie. connected nodes) the lower its PageRank goes. On a side note, there have since been a variety of PageRank types & refinement algorithms, as well as reasons why the random surfer model does not apply quite the same way that it used to, namely since the introduction of nofollow links. A fresh Google+ post starts out with the highest level of authority available from its own homepage, as newer posts are added above, its authority, as well as its freshness and relevance gradually decrease. Under typical circumstances on an active profile, for a post that is NOT re-shared or appropriately engaged with, by the time this post reaches the Google Search index, hours or even days later, its maximum authority level has already been reached & from there it will only decrease based on the quantity & type of posts continuing to be shared above on that particular profile's stream. So what would happen if we could freeze a G+ profile homepage & stopped posting any new posts to its Posts stream? Over time would the homepage posts lose their authority even though they're no longer being diluted by the continuing stream of fresher posts above? Can we prove that these posts would actually keep their inherited high homepage authority if they remained on the top homepage just like links would on a traditional website? YES! They would retain high homepage authority in the same way as links on a website homepage. Of course that's very hard to prove, because popular G+ profiles don't stop regularly posting. This does not at all mean that a G+ post reaches its maximum authority potential when first posted, because in fact most of the authority a Google+ post potentially receives is from reshares by other profiles. While Google+ posts that receive no engagement at all even from high authority profiles, typically receive negligible search ranking authority. Google+ posts that receive no engagement at all even from high authority profiles, typically receive no observable ranking authority. This downward spiral of unengaged post authority is similar to what was observed and covered in a September 17, 2013 article... Study Shows No Clear Evidence That Google+ Drives Ranking. While this study was excellent in principle &technical execution, the plan to isolate each Google+ share and not allow cross platform engagement (that also being unnatural for high authority shares of quality content), ultimately led to an observable falling graph line of all the linked test pages in search ranking results and an observation of "no clear evidence that Google+ drives ranking." If this study had instead been titled, Study Shows Isolated and Un-engaging Google+ Posts Do Not Drive Ranking. ...then I would have to agree, as results were quite similar to the common pattern of unengaging posts. I have previously mentioned other flaws in said test (including irrelevant titles & orphaned test pages), but which I currently do not believe would have caused quite as poor a showing if at least the posts had received a good level of on platform authority reshares & user engagement. 3. 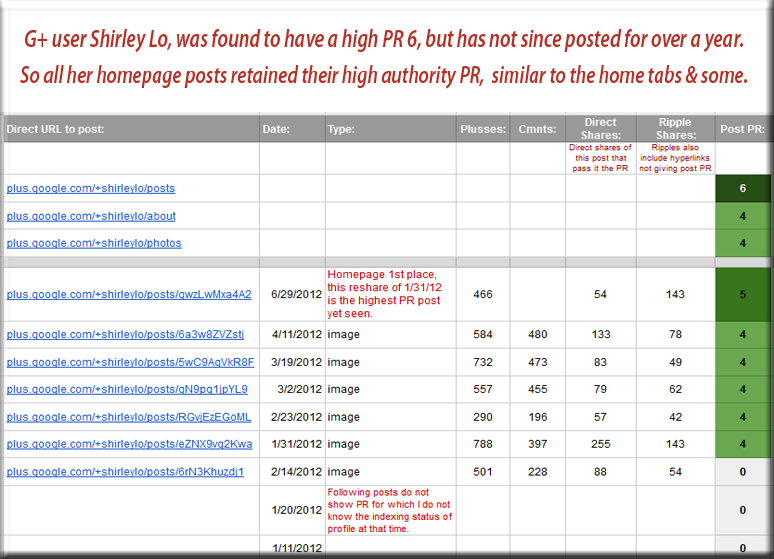 In search of the Google+ post authority source. So where do individual G+ posts get most of their ranking authority from if not from the initial high authority profiles they are posted on? Is there observable evidence that shows varied authority levels received by G+ posts? 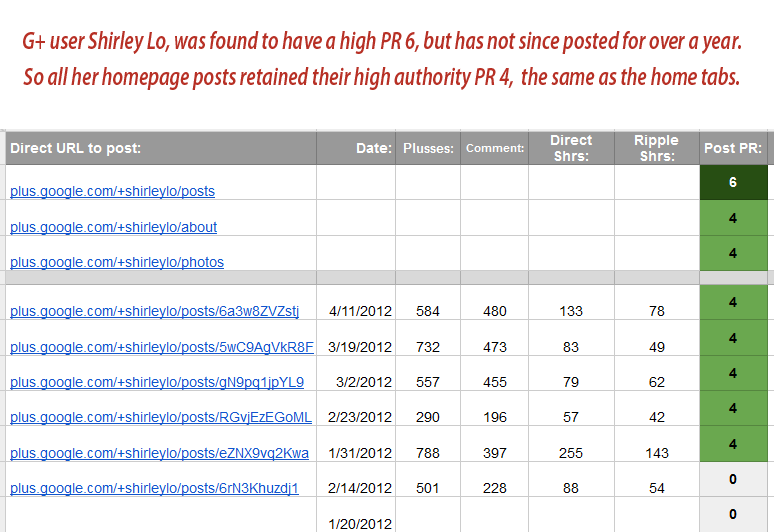 How do we prove Google+ posts on the same profile receive diverse levels of authority? 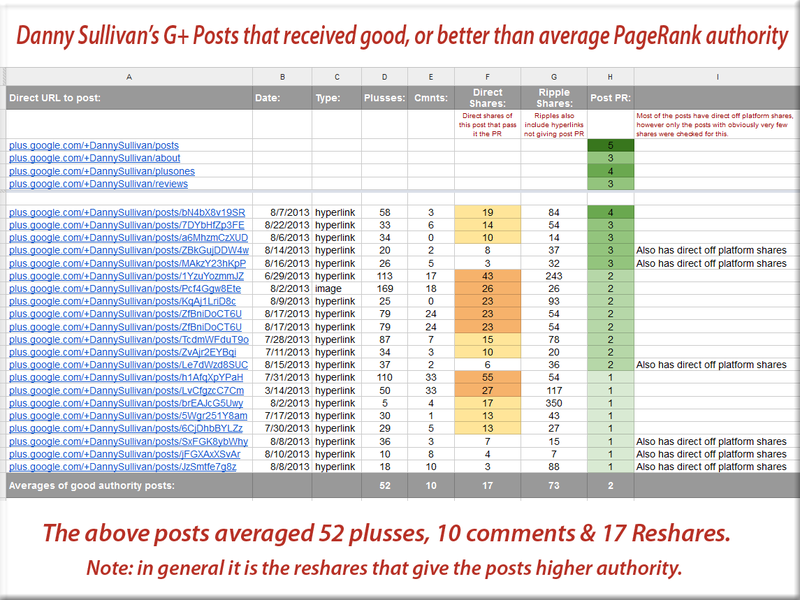 What is particularly different on G+ posts that retain high authority & eventually show TBPR? Courtesy of the 12/13 PageRank update, we can now go back & find out what authority scores Google assigned to some of the past Google+ posts, and see specifically how some of the different types of posts fared. This appears to have affected a large number of posts showing TBPR. So until the next PR Toolbar update (yes, they will continue), we're not able to numerically observe a majority of the PR authority that's been distributed on the Google+ platform. I have however found that some G+ profiles with high authority that received custom URLs at a very early stage, do show a significant amount of PR Toolbar rankings on their older posts, for which we have to go back before the first week of September 2013 to view them. It turns out the popular +Danny Sullivan profile has a good deal of observable data on last year's posts. While I have analyzed and observed hundreds of different posts and profiles with mostly similar patterns (and a few anomalies), for now we will stick with the data on this specific profile. So what can we see from the above & related data? G+ posts that receive a significant amount of direct engagement (mostly direct shares), especially from high authority profiles, eventually retain good amounts of authority & may later end up showing TBPR. On the other hand, analysis of hundreds of posts that did not retain notable authority after a significant period of time, shows that on average they have less cross engagement from other G+ users. Especially notable though, is that no matter how much PR authority a profile has, its posts will *never receive enough authority to show TBPR if there are no reshares & engagement from other G+ users. 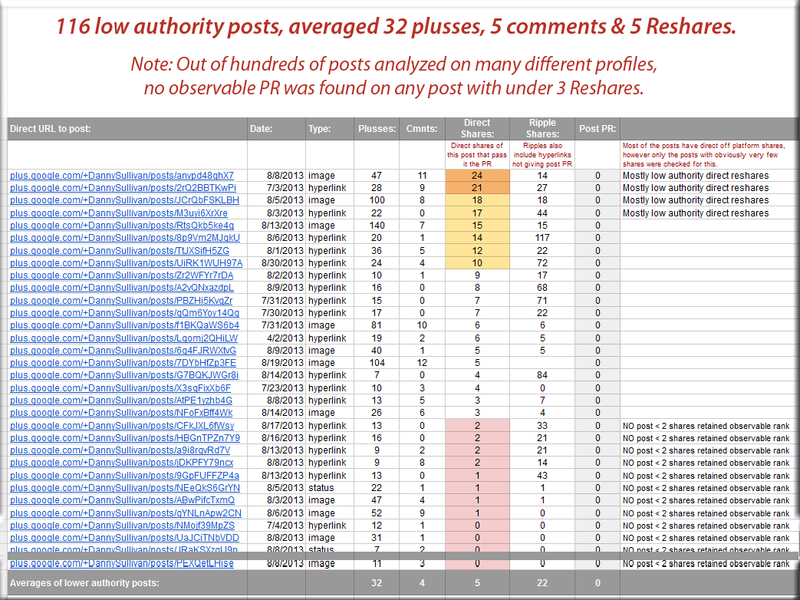 Google+ posts that receive no authority reshares eventually retain comparatively low authority. Even high authority shares eventually retain little authority without sufficient engagement. Initial shares on a G+ profile homepage, closely mirror authority of the profile's own tabs. Very important to note, the PR0 is actually blank (N/A) & does not mean absolutely no PR. PR blank (N/A) only means there were not enough back links to reach a TBPR of 1. In conclusion, what search ranking benefits can we get from posting on Google+? What is the point of trying to collect PR from follow hyperlinks in the G+ stream if it is continuously being diluted by the regular stream of new content? So I think if you're using Google Plus as a way of link building to try to drive PageRank to your site, you're probably doing it wrong. So that's not something where I'd focus on anything like PageRank, but instead use Google Plus to kind of engage with your audience & make sure that you're doing the right thing on your website, see what people are interested in & see what you could be improving on your website. And I wouldn't use that as a way to kind of drive PageRank to your site. I'd really try to use Google Plus more as a way to engage with people and to interact with them, share your content, see how people react to it & think about ways that you could improve your content together. That said, there are other more important ranking benefits to be received which are not yet well covered and which we will see more of as the Google+ platform matures. Google+ and its relative, Google Authorship, were specifically structured so that authority from authors' content would flow into their profiles & not by default away from. There are significant reasons for that which will become clearer as we continue this story. This is both how and why Google Authorship was setup and the benefits to be seen from this are only just beginning to be understood and I'll have more on this soon. What I have seen that is particularly advantageous about using G+ to promote high quality & engaging website pages and blogs is that, a popular post can become a real rocket booster for your blog or webpage, pushing it up quickly in the Google's search results where it can start to gather other confirmatory ranking signals, such as CTR and other positive patterns in user behavior. From there it is up to the quality and interest of your content, as to whether it will continue to receive other positive affirmations from the wider web. Positive citations from other peers for example, would typically be a next step that we would see in the continuing footprint of quality content. Brilliant reading so far on Google + effect on seo! Just a quick note to tell you that I have a passion for the topic "Google + effect on seo" at hand. Thanks! I feel emphatically about it and love adapting more on this subject. I simply discovered this blog and have high trusts in it to proceed.